Arclinea San Diego’s kitchen design showroom is located in downtown San Diego and features the award-winning Arclinea Collection of contemporary, Italian cabinetry. The award was officially announced at K/BIS, the nation’s largest kitchen and bath trade conference-April 11-13, 2008 in Chicago-with feature editorial in the current issue of K+BB magazine. Kitchen and Bath Business (K+BB) is the nation’s leading publication serving kitchen and bath professionals, including kitchen designers, interior designers, architects and manufacturers, as well as the official sponsor of K/BIS. The kitchen showroom was designed by Arclinea San Diego president and owner Lisa Wilson-Wirth, ALLIED AIA / ASID INDUSTRY PARTNER, and Aaron Anderson, AIA, principal, Studio: Anderson, Inc.
Arclinea San Diego’s downtown showroom is open five days per week-Tuesdays through Saturdays. The company provides comprehensive kitchen design services for kitchen remodeling, renovations and new construction, specializing in contemporary European kitchen design trends and products. 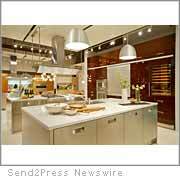 Their services include complimentary design consultations for homeowners and the trade. Arclinea custom kitchens can be found in many different living environments-from traditional and modern residences, to custom-built homes and luxurious multi-unit residential developments. For more information about Arclinea San Diego, visit http://www.arclineasandiego.com or call 619.564.7440. With a legacy of craftsmanship since 1925, Arclinea Arredamenti SpA, is an industry leader in the worldwide kitchen market known for its cutting-edge design, use of exquisite materials, innovative technology and ecological commitment. The Arclinea Collection is designed and coordinated by internationally celebrated architect Antonio Citterio, designer of products for B&B Italia, Maxalto and Flos, among others. The Collection has been awarded a number of prestigious design awards including the “Metropolitan Home Modernism Award” and the “Elle Decor Edida.” For more information, visit http://www.arclinea.com . Arclinea San Diego is the exclusive San Diego area distributor of the Arclinea Collection; one of nine distributors in the United States. The company’s flagship San Diego showroom, located at 2515 Fifth Avenue in the Park West neighborhood downtown, features examples of the entire Arclinea Collection, including the company’s newest-generation of products. In addition to Arclinea, the company is also a dealer for Gaggenau and Miele cooking appliances and CaesarStone Quartz Surfaces. For more information, visit http://www.arclineasandiego.com or call 619.564.7440.